Every event is unique and a new inspiration. We customize every celebration and prices vary according to your particular needs. Location, number of guests, design, logistics and complexity of your event will add or lessen your costs. We invite you to make an appointment to view our portfolios while we take the time to get to know you and discover your passions and tastes. We work with you to create everything from simply elegant celebrations to lavish productions. Tosca Clark of Tosca Productions is a highly seasoned, professional wedding producer and designer, since 1994. She has carved out a unique niche in the wedding and event industry by specializing in designing and incorporating culture and tradition into elaborate, yet seamless celebrations. 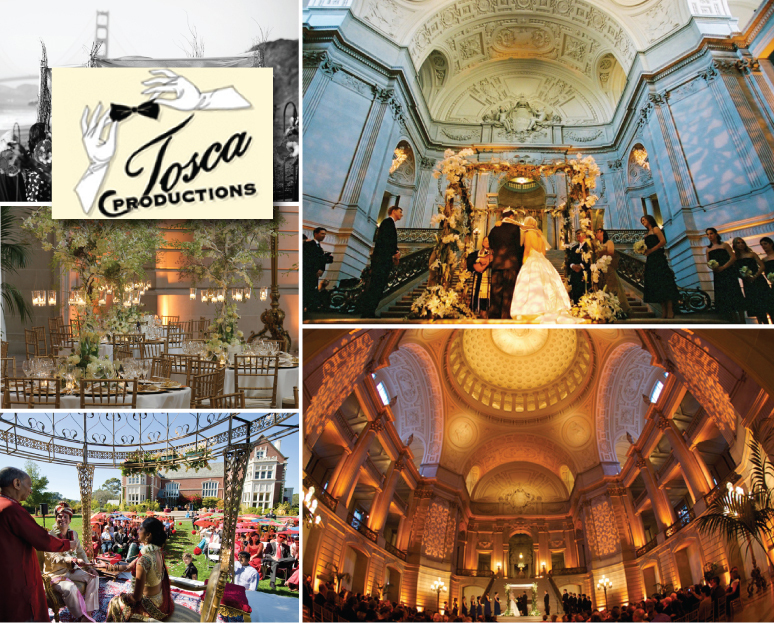 From simply elegant weddings to lavish productions, Tosca’s organizational and social skills has placed her on the preferred lists and lips of many highly respected locations in the industry of the Greater San Francisco Bay Area. Tosca’s fresh and creative ideas are subliminally sewn through every aspect of a wedding. From the invitations, menus, programs and place cards to lighting and floral design ? each item is carefully coordinated to create a “WOW” factor when guests walk through the doors of the ceremony or reception. Her reputation for exceeding her clients’ expectations is well-deserved, earning her a place on Silicon Valley “Valley Scene” reader’s choice list as one of the top 5 wedding planners in the bay area, “Best of the Bay” Wedding Planning from Kron 4 and The Knot “Best of Weddings” top picks. Because only the best will do, Tosca teams up with a wide selection of specialized vendors and designers to produce one-of-a-kind unforgettable events. Tosca only coordinates a handful of weddings and events each year to ensure each client has her team’s undivided attention.